First an apology for missing my regular Wednesday post. I needed time to get this post completed. Now that that is out of the way, let's get to the post that so many have been anxiously awaiting. Several months ago Disney celebrated the 40th Anniversary of the opening of the Magic Kingdom park at Walt Disney World (WDW). This park was the crowning achievement of the great man who created that simple mouse who now rules over so many Mousejunkies around the world. Today WDW covers 47 square miles of Florida landscape and is one of the most popular vacation destinations in the world. My first experience with the most magical place in the world was in early in 1972, at least that is what the pictures that have come into my possession recently. About the same time that WDW celebrated their anniversary my mother gave me a stack of pictures from from that vacation. 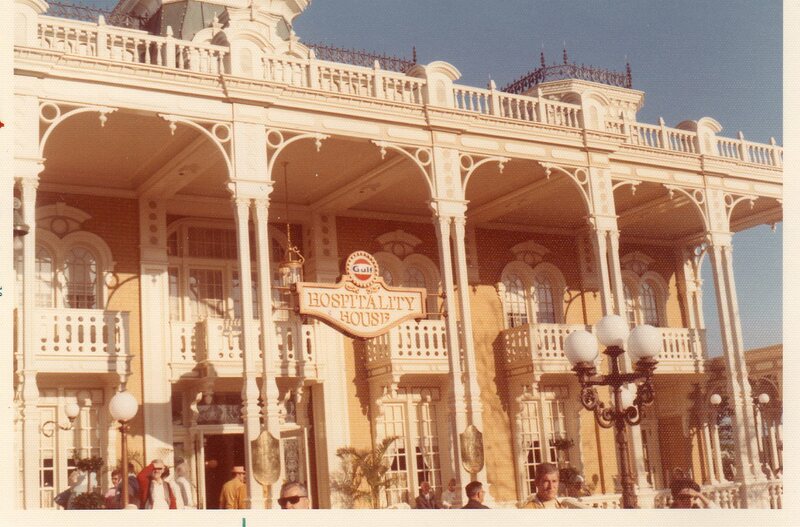 The dates on the pictures indicate that they were developed in March of 1972, six months after the opening of the Magic Kingdom. I stuck upon an idea as I looked at this pictures, Interestingly enough, I also had a trip scheduled to go to WDW and would have a chance to see all these places in the pictures from the view point of 40 years later. Due to the number of photos and the size required to display these photos, I will have to do this in several posts over the next week. We will start with the entrance to the park and Main Street in this post, and I will move around the park with the remaining pictures. 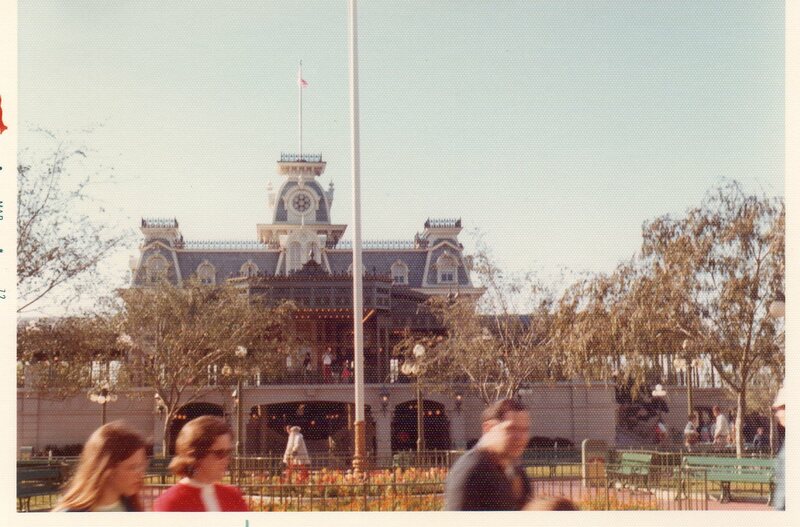 To the left is a picture taken of the back of the Main Street railroad station. Since I was going back at Christmas time I could not get a picture that was from the same location. However, if you click on the photos you can see a few things that have changes. They have reduced the amount of landscaping surrounding the flagpole, the trees have been kept trimmed and some even have been replaced, even the roof color has changed somewhat. This picture is the Gulf Hospitality House where guests could go to get travel information in Florida and get other assistance from the castmembers inside. As you can see with the associated picture to the right the building is now the theater and the location for character meet-and-greets with the Disney Princesses and Mickey and Minnie. Although there are many changes, especially the name of the building, there are still a lot of similarities to the original building.. However, there are new lanterns out front, in addition to the original lanterns, and there are now queue time indicators for the meet-and-greets. That is it for this segment. In the next segment we will be looking back down Main Street and also at the old Borden Ice Cream Parlor.